How is it possible that we find ourselves beginning the last two weeks of August! I realized this morning that my kids have two weeks and two day until school starts - - - WHAT!!!!!!. It seems I've been enjoying my summer of laziness a little too much and better get my act together soon! Speaking of which, while watering the slightly too crispy looking flowers in my garden this morning I couldn't resist the urge to clip a handful of Hydrangea's. Since I thought they would be perfect to help show off my newly sewn tablecloth I didn't hesitate . . . much. Ahhhhh, nothing beats a jar full of Hydrangea's . . . back to these beauties in a minute. First take a look at my newly finished tablecloth. Now back to the beautiful Hydrangea's. This bunch were clipped from my Limelight Hydrangea's. I love that they are just starting to get a touch of green and a dusting of pink to them. I think they are just gorgeous at this stage. Since the flowers were so pretty and I didn't want to just set them down and walk away. Such beauties deserved a little more of my attention. A set of jelly molds I picked up at a recent flea market were set between the jars of flowers to hold tea lights. There you have it. Hydrangea's and a tablecloth. Pretty exciting stuff for me! Just because I can't help myself, here's one more pretty photo for you. Very pretty table setting, Robin! Your flowers are gorgeous and those cloth napkins are really sweet. Great job on the tablecloth, too!! Your table looks so pretty. Your hydrangeas would be pretty dried this winter. I love repurposing Ikea tablecloths. Your tablecloth is beautiful! Great job. Love your ball jars, flowers, and jelly molds too. All so pretty! 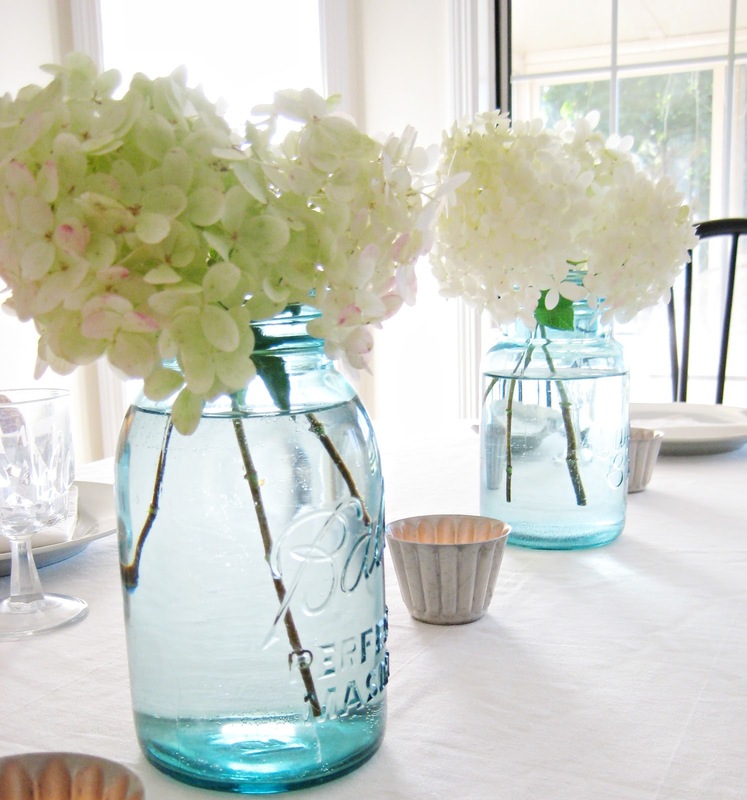 Your tablecloth is beautiful, Robin...and hydrangea in aqua jars...perfect! I just love it all! Thanks for the inspiration. Your ruffled tablecloth is beautiful, you did a great job on it. The hydrangeas are lovely! LOVE your tablecloth Robin...it's so simple but so pretty! I'd like to make one myself but I'm not exactly an expert at sewing. Would you mind giving more details on how you made the ruffle and the size of the ruffle? Any extra info would be great! Thank you!! I love the way you put together 'things' and wonder if I could pay you for a jpg. of a photo of blue mason jars with hydrandeas? Would you contact me at LampGoods@gmail.com so I can speak with you in more details.